How to Build Steps with Stone - Legends Landscape Supply Inc.
Natural stone is a versatile material for creating formal, elegant steps to your home entranceway; natural, informal steps in the landscape or almost anything in between. Though natural stone may seem like a challenging material to work with, it is actually no more difficult than any other product. Building your own stone steps is a rewarding and fun project for creative do-it-yourselfers. What Stone Should I Use for Steps? Natural flagstone comes in a variety of colours and sizes. It will not be hard to find a colour and finish option that works with the style of your house. Some flagstone comes with a split face or rock face finish that is slightly uneven and naturalistic. You can also get sawn square or rounded bullnose flagstone.It all depends on what you want. Limestone, shale, and sandstone are all native source materials for flagstone. There are also size options for your stone steps. Smaller and thinner stones can be pieced and placed together to form individual steps. One thin, individual stone is often used for the surface or tread of each step. Working with smaller stones requires a little more skill as they usually need to be mortared together. Large stones can sometimes be used as an entire step. Depending on the width of your stairs and the height of each step or riser, one large stone cut to the right dimensions makes an impressive, attractive step. This approach works particularly well for informal steps away from the house. Stones of this size are quite heavy; you will likely need helpers or mechanical equipment if you are working with large, boulder-sized stone. Your steps should be set on a porous material with good drainage. Four to six inches of aggregate or sand will work. Make sure the material is compacted, firm and stable before you start placing stones. You may also need to install perforated drain pipe behind and under your set of steps to make sure the base material does not stay saturated. Always start at the base of your steps and work your way up. This makes construction much easier. The surface of each step should have a very slight slope from back to front for drainage. For smooth surface steps, one-eighth inch per foot is a minimum; rough textured stone should slope at one-quarter inch per foot. Formal stone steps will have cheek walls or retaining walls on either side. The material for these should match or blend well with the stone for your steps. If you have used interlocking units for your retaining walls, consider using matching interlocking step units. This may make coordination of the overall project easier. 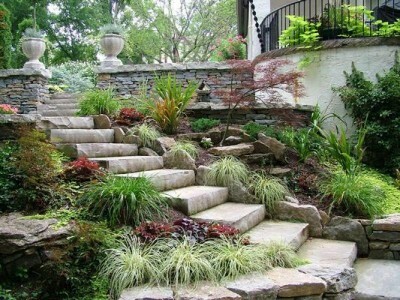 For informal landscape steps, make sure the steps are set into the slope; they will look more natural. Informal plantings and rock arrangements on either side are a nice complement. Remember that exterior steps often need lighting for safety. Consider how lighting might work with your steps before you start the project. While steps are a necessity for many home sites, they are also an opportunity to create interest and define different parts of your landscape. They can help to identify the style of your home before someone even enters your house. In the backyard, they can serve as informal seating while connecting different levels of your landscape. Talk to the experts at Legends Landscape Supply about the types of stone steps we provide and options for installing them in your yard. Call or visit our showroom today. Written on Tuesday, August 26, 2014.